Four out of the six specialist societies; the Crested BC, Lutino & Albino BS, Rare Variety & Colour BS and Variegated BC are to hold a combined Annual Members Show & AGM’s rather than individually events. 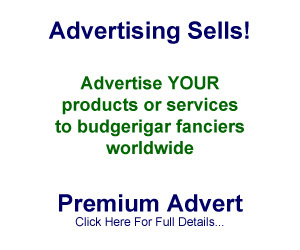 The aim is to enhance the interest in the specialist varieties and also to encourage better attendance at AGM’s as many fanciers are members of a number of the specialist societies. With this in mind the concept of such an event was discussed at the 2013 AGM’s and approved and a group of senior officers from those societies met at the BS Club Show and laid down the foundation for this event. 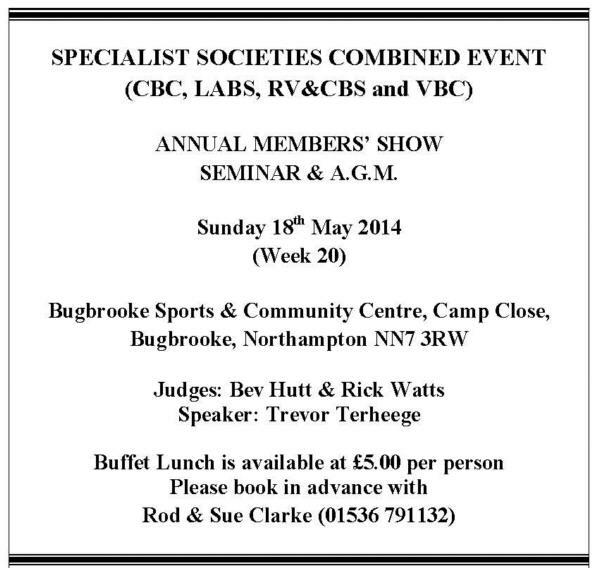 The date is Sunday 18th May 2014 (the date already used by CBC, LABS and RV&CBS for their Annual Members’ Show) and the best and well known venue to accommodate this event will be Bugbrooke Sports & Community Centre, Camp Close, Bugbrooke, Northampton NN7 3RW (the venue for the national Specialist & Rare Variety Open Show). 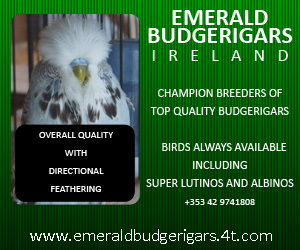 The show Classification is the same as the national SRVOS classification catering for the varieties that come under the four specialist societies. Judges & Speaker – Bev Hutt & Rick Watts will be judging the event and Trevor Terheege will be the guest speaker after the buffet lunch. Each society will provide its own specials as they currently do for their individual shows. The entry fee per cage is 30p per cage including sales with 15% commission on sales; entries to be for current paid up members only. The admission to the event will be free. Catering – Sue & Rod Clarke will do the buffet lunch catering at £5 per head but this must be booked in advance. Mini schedules will be sent out to all the members of the four specialist societies and entries can be sent by post, phone and email or on the day to the show secretaries Ian & Pat Fielding. Three societies (LABS, VBC and RV&CBS) will have their AGMs at the event but will be staggered to allow more members to attend; with the talk by Trevor Terheege scheduled for 2.00 p.m.